As a shareholder, there are a number of ways to withdraw funds from your corporation, i.e. : you can declare dividends, receive salary, or take bonuses. However, each of these remuneration strategies has personal income tax implications. An alternative method of withdrawing corporate funds is to have the corporation issue a loan to the shareholder. A properly implemented shareholder loan will allow you to avoid personal tax consequences. A loan from the corporation to a shareholder or connected person (not dealing at arm’s length with the shareholder) will result in a deemed taxable benefit to the shareholder unless the entire loan is repaid within 1 year after the end of the corporation’s year-end. In addition, the shareholder must pay interest on the loan at a rate equal to or greater than the prescribed interest rate set by the Canada Revenue Agency (CRA). The interest payment must be made no later than 30 days after the end of the year. However, if you use the loan proceeds to produce income (i.e. : business or investment), the interest paid is deductible for tax purposes. It is imperative that all loans be properly documented in a written agreement or other documentation such as a corporate resolution setting out the terms of repayment. Assume you borrowed $100,000 from your corporation on January 1, 2014 and your corporation’s year-end is December 31, 2014. In this case, you must repay the loan by December 31, 2015. Otherwise, the loan amount will be included in your personal income for the 2014 taxation year. Also, interest owing must be paid by January 30, 2015 to avoid the interest taxable benefit. Using the prescribed rate set by the CRA, the loan interest will be 1% or $1,000 ($100,000 * 1% * 365/365). If the interest owing is not repaid by January 30, 2015, the $1,000 (or the unpaid interest) will be included in your personal income for 2014. What happens if you received a loan from your corporation, repaid the full amount of the loan, and then immediately after repayment you received a new loan for the same amount. I will illustrate this concept through an example. John Bacon is the sole shareholder of JB Inc. and JB Inc. has a December 31 year-end. On March 31, 2014, John Bacon received a loan of $50,000 from JB Inc. John Bacon cannot afford to repay the loan, but knows that if he doesn’t pay it back by December 31, 2015, he will have to include the full amount of the loan in his personal income for the 2014 taxation year. As a result, John Black decides to repay $50,000 to JB Inc. on December 31, 2015, and then he immediately receives a new loan on January 1, 2016 for $50,000. 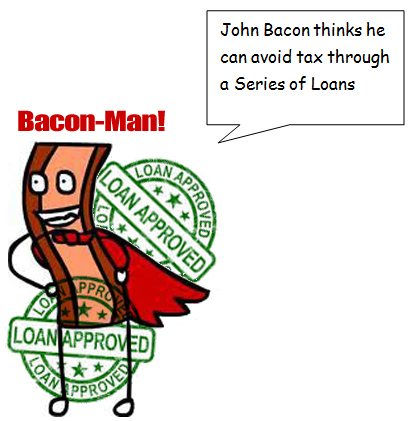 John Bacon is very happy because he got to keep the $50,000 and he wrongly thinks that he beat the taxman. The CRA prevents shareholders, like John Bacon, from avoiding tax using a ‘series of loans.’ In the example above, the original loan of $50,000 received by John Bacon during the 2014 year will be included in his personal income for the 2014 year. So you can see that John’s strategy of repaying a shareholder loan and immediately borrowing the same amount from his corporation does not avoid tax. It’s common for corporations to advance funds to the shareholder throughout the year, and at the end of the year salary or dividends is paid to clear the shareholder loan account. If you decide to take a salary, the payment must be made and recorded in the corporation’s books by the end of the fiscal year. The associated T4 slip must be prepared and issued by the end of February of the following year. Please note that payroll deductions (i.e. : employment insurance or Canada Pension Plan) must also be remitted on time. Similarly, if you decide to take dividends, the payment must be made and recorded in the corporation’s books by the end of the fiscal year. The T5 slip must be filed no later than the end of February of the following year. Another point to consider is that the shareholder loan sits on the asset section of the balance sheet of the corporation. As this asset is not considered to be employed in an active business, this may jeopardize your corporation’s status as a Qualifying Small Business Corporation (QSBC). The consequence of this is that you may no longer be eligible for the $750,000 Lifetime Capital Gains Exemption (LCGE) on the sale of the shares of your corporation. Is it Better to Receive Management Fees or Salary from Your Corporation? What tax refunds and benefits am I eligible for?